These infections can be devastating and even deadly. According to the Centers for Disease Control and Prevention (CDC), hospital patients in the United States get nearly 2 million infections each year, while receiving care. That is about one infection for every 20 patients. For more information about HAIs please visit the CDC page on HAIs. CDC publishes the annual National and State HAI Progress Report which looks at HAIs at a national and state level. Additionally, the Hospital Compare website from the Centers for Medicare & Medicaid Services (CMS) contains information about the quality of care (including HAIs) at facilities across the nation. It is searchable by facility name or region. In 2011, the Hawaii legislature passed HRS §325-2.5, relating to HAI reporting. 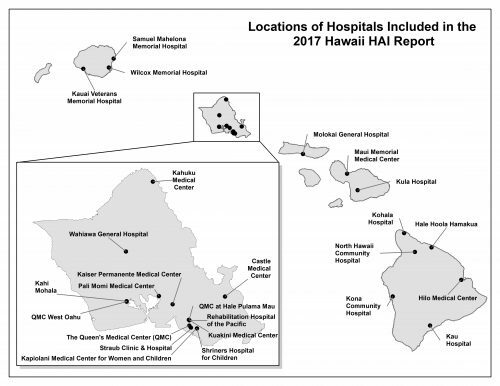 The statute instructs the Department of Health to prepare public reports of Hawaii HAI rates using methodology developed by the CDC.